It's difficult to get rid of wild violets growing in your grass unless you resort to using herbicides. This fact, alone is enough to bring "green" homeowners to the conclusion that it's best simply to treat them as lovely wildflowers rather than as weeds and leave them alone. For those less tolerant of sharing lawn space with other plants, however, learn which type of herbicide to apply so that the weeds are killed but the grass is not. The seemingly simple name of "wild violets" (or "common violets") sounds simple enough, but, actually, it covers a great variety of plants. Plant taxonomy lists Viola sororia (you'll also see the name Viola papilionacea) as one of these plants. Since Viola sororia is the kind most likely to be found growing as a lawn weed, it will be used as an example here. Just remember that other types do exist. Viola sororia is considered a broadleaf, herbaceous perennial by botanists. Wild violets are also sometimes considered herb plants, since they possess medicinal qualities. Wild violets are best known for their namesake violet-blue flowers, although the blossoms do occur in other colors, such as white. Markings of a different color are often present, adding further beauty to this classic flower. A patch of purple violets growing on a lawn can be a truly gorgeous sight. The foliage is more or less heart-shaped but may also taper to a fine point. The surface of the leaves is waxy. The plants commonly grow to be about 4 to 6 inches high, although, depending on conditions, they may grow taller than that. They have a fibrous root system. Various types of butterfly caterpillars treat the leaves as a food source, making wild violets valued by gardeners looking for plants that attract butterflies. Viola sororia is native to eastern North America. These flowers grow in planting zones 3 to 9. The plants prefer partial sun to partial shade. If you were growing them as a landscaping plant, the recommended soil would be moist to average. These conditions will promote the best display. But, as anyone who has tried to get rid of them knows, these wildflowers don't need much help to survive. In fact, they may well survive a drought better than your lawn grass will. Moreover, they are edible weeds, as both the flowers and the leaves can be eaten. Young leaves are best for eating. The taste reminds you of nuts. They also have medicinal qualities, due to an acid they contain that can break down corns and warts. Don't confuse wild violets (Viola sororia, etc.) with African violets (Saintpaulia spp.). The latter, which are popular houseplants, are inedible. Furthermore, they're not even true violets; they were so named simply through floral resemblance. Their botanical name refers not directly to the Saint Paul of the Bible but to Baron von Saint Paul, a plant collector who was responsible for introducing them into Europe from Africa. Even if you keep them from going to seed, the fact is that some types of wild violets can spread via stolons or rhizomes, so they're difficult to control. You'll probably have to repeat your control efforts, as you are bound to miss something. As big a problem as that sounds like, trying to kill them when they're growing in the lawn is even worse. For one thing, all of the holes would leave your lawn looking like a moonscape. 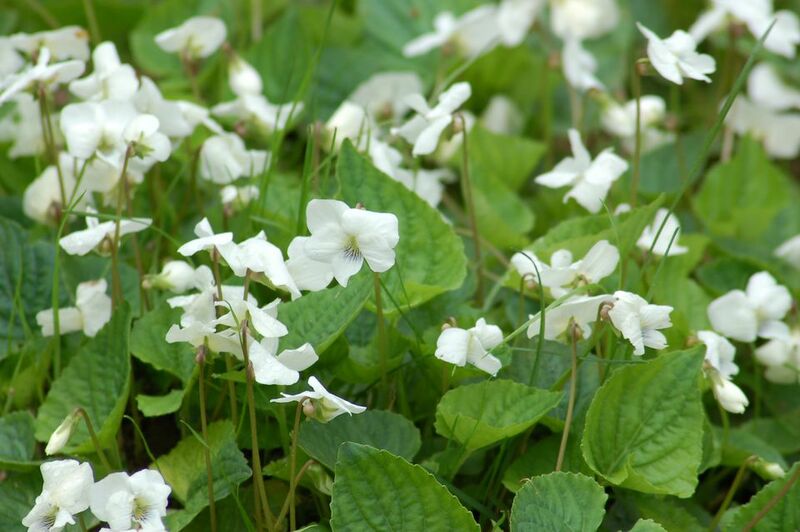 Moreover, you can't use mulch as an ally when trying to control violets that have become lawn weeds (whereas applying mulch is a smart preventive measure in a flower bed). Unfortunately, that means that, if you are committed to killing violets in your lawn, you may well have to resort to using an herbicide. The herbicide must be a selective type that will kill the weed but not the grass. Products that contain triclopyr are recommended (unless your lawn is made up of bermudagrass). One such herbicide that is readily available at home-improvement stores is Weed-B-Gon Chickweed, Clover & Oxalis killer. Expect to have to follow up with repeat sprayings. The optimal time to spray with the triclopyr is autumn. That is when plant foods are most active in traveling down to the root system, as the plant prepares for winter. Send triclopyr along for the ride, and you will be able to cause some damage. Very likely, this one application of herbicide won't kill the violets outright, however, so you might want to follow up next year in spring and then again in fall (as needed). Because of the waxy coating on the violet leaves, some advise mixing a surfactant into the herbicide before spraying. "Surfactant" may sound like a fancy word, but just think of it as something that aids your herbicide so that it will work better. A surfactant helps out by reducing surface tension. A surfactant will help your herbicide to cut through the waxy surface of the leaf and reach down to the area where it can do the most damage. There are commercial surfactants you can buy, such as Spreader Sticker. But you can save money by mixing in dish soap, instead (one tablespoon per gallon of spray). It's often difficult for the non-expert to identify the various wild violets beyond any shadow of a doubt. Part of the problem in identification lies in the fact that the plant in front of you at any given time may well be a natural hybrid plant.